I have two beautiful Norwegian Forest cats and they love to travel. When I first picked them up from their breeder, in Durham, and drove them back to their new home in London they were fine travelling in the car. From day one my cats hated to be in a carrier and so, on the long drive back, they both slept in our arms. Well, one of them anyway. The other one had a whole seat to themselves up front whilst my husband sat in the back as a passenger. From the age of six months I trained my cats to walk on a lead and to travel everywhere. Not all cats like to travel but we were lucky in that out cats always saw it as an adventure and not just leading to a trip to the vets! So, first of all you have to decide if travelling would suit your cats personality and only they could tell you. My cats are both curious, bold and outgoing and so introducing them to the great outdoors was fun for them. We chose quite times of the day, we let them decide where they want to walk and we are vigilant in watching for dogs not on leads. Most dog owners are very respectful and always cross the road when they see us with our cats. Never force a cat to go outside. They will very much tell you if that is what they wish to do. So, when it comes to travelling with your cats in the UK you will need places to stay that allow pets. Some places say no to cats because humans are more likely to be allergic to cat hair than dogs. They are some great Pet Welcome travel directories which look very much geared to dogs but give any cottage or BnB owner a call and most will be open to cats staying. Check on Amazon under the search words Pets Welcome. Make sure your car is carrying a litter tray, lots of water, air con on full if the weather is hot and plenty of breaks if you are travelling a long distance. 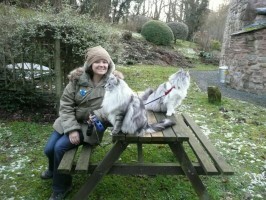 We travel a lot to the Lake District and our cats are well known in Wasdale. We try to travel at night to our destination when the traffic is quite and it is cool. I think we pack more things for our cats then us. 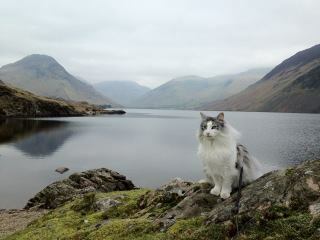 Last year I took a one off photo of my cat Kiki sitting by Wasdale Lake. I posted it on Twitter and soon as The Cumbria Tourist Information using the photo for their web site. Kiki’s photo was also snapped up by brilliant web site Travelling Cats. I write about training a cat to walk on a lead in my blog.